The U.S. average retail price of diesel dropped 5.4 cents to $3.207 a gallon, the U.S. Energy Information Administration reported Dec. 3, as crude oil prices fluctuated but remained below $55 per barrel. The drop in diesel marked the seventh consecutive weekly decline in the price of trucking’s main fuel. The price has fallen 18.7 cents during that period. Yet diesel costs 28.5 cents a gallon more than it did a year ago, when the price was $2.922, EIA reported. Average diesel prices fell in all regions of the country, led by the Midwest, where it dropped 6.8 cents to $3.117 per gallon. Meanwhile, the national average price for regular gasoline dropped 8.8 cents to $2.451 a gallon, according to EIA. The average price is 4.9 cents lower than a year ago. Average gasoline prices fell in all U.S. regions, most sharply in the Gulf Coast region, where it tumbled 9.3 cents to $2.123. The cheaper prices for diesel will not stop trucking companies from improving their efficient use of the fuel by using better tires or upgrading to newer trucks, helping to improve profit margins. John Lupusor, president of MC Carrier of Las Vegas, told Transport Topics that his firm ordered 60 new T680s from Kenworth. That brings his fleet to 112 trucks, with 22 T680s to be delivered in early 2019. Lupusor said that his older fleet models were averaging 5.9 mpg, but the new trucks are averaging 7.8 mpg. The company’s fuel surcharge is based on an expectation of 6 mpg. Better mileage puts money into the company’s pockets. “Having a better fuel economy on the trucks helps us keep the difference,” Lupusor said. 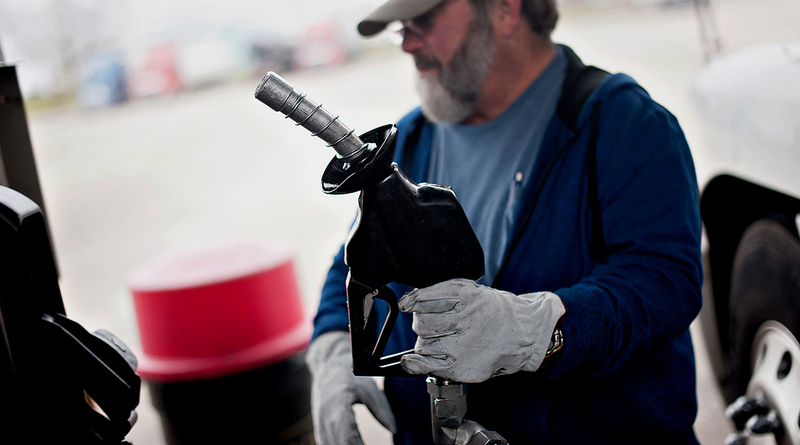 Oil producers seemed intent on aiding truckers in their quest for fuel savings. On Dec. 4, oil prices fell as doubts rose about OPEC’s floated production curbs, all while American oil inventories showed surpluses, according to Bloomberg News. Officials from OPEC had suggested as much as 1 million barrels daily could be cut from production. But after a Saudi official seemed to indicate the cuts would not materialize Dec. 4, West Texas Intermediate for January delivery slipped 32 cents to $52.63 a barrel on the New York Mercantile Exchange, according to Bloomberg News. One analyst said it could go lower. “There’s some downside left,” said Denton Cinquegrana, analyst for Oil Price Information Service. Gasoline prices had been above weekly rates from a year before, all through 2018. But that changed last week, Cinquegrana said, as prices even dipped below $2 a gallon in as many as 20 states. Cinquegrana said the Saudis and Russians are not likely to make drastic cuts in production. “OPEC is not in the mood to surprise the market one way or the other,” he said. A potential problem could be Qatar’s planned withdrawal from OPEC in 2019. Qatar is being blockaded by Saudi Arabia and is seen as tired of being led by its rival in OPEC. The small Arab nation in the Persian Gulf produces only 600,000 barrels of oil per day, according to OPEC. But Qatar is the world’s leading exporter of liquefied natural gas. Its departure from OPEC is not likely to rattle prices. Saad al-Kaabi, Qatar’s energy minister, said at a Dec. 3 news conference that politics was not a reason for the departure and that Qatar would honor its oil commitments. So for now, oil floats at a historically low cost. For trucking fleets, a further fall in diesel expense could take time, as low oil prices take time to affect producers of diesel and regular gasoline. Fleets stand ready to guard against fluctuations. Some use fuel cards distributed by companies such as P-Fleet Inc. The San Diego company has offered fuel cards for 32 years. The cards lock in industry-best controls to reduce costs and can be used at a large number of stations. P-Fleet lets clients view current diesel prices online to identify the cheapest fuel locations along various routes. P-Fleet President Jake Zuanich said the falling cost of oil takes time to be reflected in retail diesel. Zuanich said he believes further relief for the trucking industry should last for a while. Still, Zuanich takes note of the relative volatility of oil prices in the last year.